ok so kate’s birthday go out drink night was on thursday. kate had a great time i had to show up a bit late (work) but most of kate’s friends made it out. she’s rock’n the big 23 and taking a week vacation for the event.she’s be in nantucket relaxing and buying things made of wicker. hence no big gift till she return. bought myself a few extra days. now that i can post video on the blog i got a little clip to help you feel like you were there. in other news my good old friend from college sidecar (who i haven’t talked to in years) has a cool younger brother Michael McClendon that makes the movies. emailed me the other day and asked me to take a look at his movies. it’s on myspace and it look really good. excellent quality and really nice editing. It’s split into four parts and i watched them all back to back. some really funny part i have to say. If you get a chance check it out it’s worth a watch. although I don’t really have one topic to blog about today I thought I might share some observations of the past week. 1. bacon…. i always thought that people exaggerated a bit when it came to bacon on a sandwich. i had a chicken cutlet with bacon and cheese on tuesday and i gotta say bacon indeed makes it better. for those of you that fly the bacon flag… i understand. 2.if you think you lucked out by finding the only non-packed car on the E train during rush hour, you sir are wrong. often times random cars on the E train don’t have air and in side it’s balls hot and the people look as if there in a prison camp. 4. for like the forth year in a row I’m moving apartments. it’s like i love the torture of moving and the hot iron of double rent feels like a kiss apparently. 5. i’ve discovered that drinking tea at work makes me pee too much.. The problem with this is I think my co-works are starting to think i have some sort of bladder issue.. which is not so…. it’s the tea man…… the tea. you ever have one of those days when you just think your ganna lose it? everything is annoying, it seems as if people some how know your already on edge and see it as a challenge to push you a bit further until either you head explodes in a fire ball of rage or you just black out and wake up in a pool of angry sweat. some may say it’s the heat. maybe their right the waterfall of sweat coming off my forehead right now isn’t making me any happier. maybe it’s the lack of interesting projects at work the sweat the subway the sweat and the never ending computer renderings. for example when i was getting on the subway to come home some dude was standing blocking half of the entrance this was one of many points in the day when i realized maybe i need anger management. anyway long story short it’s hot sorry for the angry blog. alright well it’s a beautiful sunday morning here in brooklyn and I’m sitting here working feverishly trying to put up all the content from last weeks forth of july trip together. we all had a wonderful time in north carolina with aaron (professor) and his girlfriend allison. they are with out a doubt the best hosts in the south. a quick rundown of what we did. saturday fireworks in the park. sunday hang out by the pool and a movie. Monday a pontoon boat day around lake norman, and tuesday breakfast and back to brooklyn. as you might have heard i brought the video camera along to do a little documentary of our trip (please excuse the poor editing). 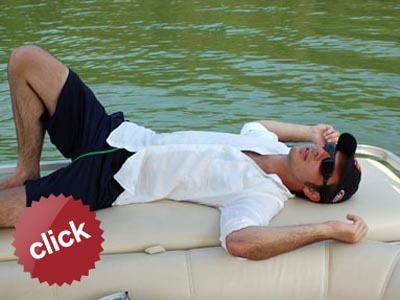 click on the picture below of me passed out from exhaustion on the boat. don’t for get to check out all the pictures in frames and the slideshow. thanks for a great time aaron and allison!!!!!!!! !